Why would he go after a mob that’s cowering in fear in a corner? :c She’s not even armed! It’s been a particularly hard journey (except for Molten Mountain, Skärva did quite well), the shark has his princess and he is in a BAD MOOD. Props go to you for creating this wonderful comic and giving up the wonder that is sleep. Sleep is for the weak. And I am a serious wimp. So yeah, I do love sleep, but it’s ok because I love drawing even more! Is it just me or does floyd’s ears seem longer then normal? Drawing him lying down like that, I kinda lost my already tenuous grasp of their proportions, so perhaps so. He’s foaming at the mouth. Also, I actually had a dream about these guys last night! 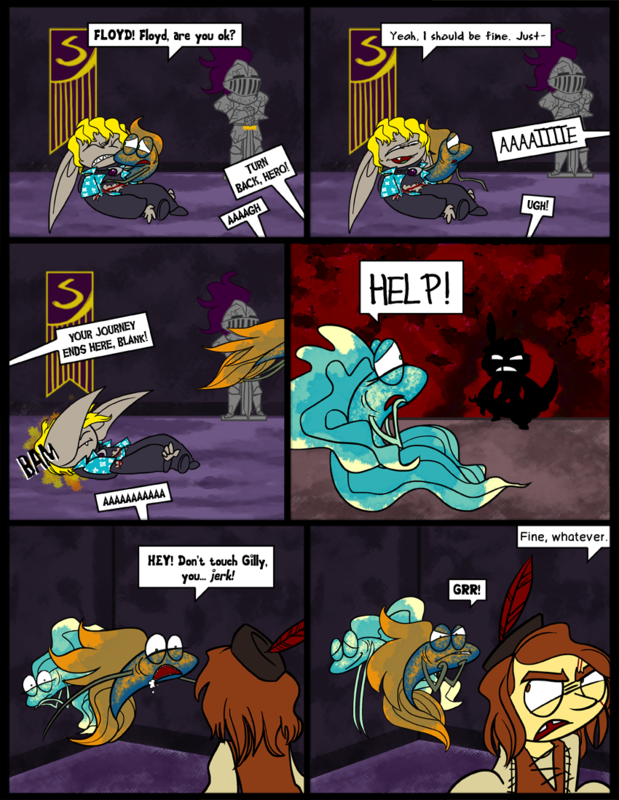 Skarva and Blank were having a comical scuffle on the floor, and then [url=http://fc01.deviantart.net/fs71/i/2011/356/9/0/princess_cadence_vector_by_aeroytechyon_x-d4juv4q.png]this[/url] walked in the door. And Blank had a nasally voice. Oh YIKES. That IS a nightmare. Yeah I dream of your characters sometimes too. Just last week I dreamed that the Power Puff Girls (yeah that show that was a hit on Cartoon Network a while ago) showed up to tell Skearva that his potion wouldn’t work because he didn’t know the “true meaning of love” or whatever, then beat the living daylights out of him. I woke up like, “Huh?” (O_o) It was wierd. Jedi. My friend. You don’t think I know who the Powerpuff Girls are? I grew up watching that show! I think they were probably right, though, about Skärva anyway. Hopefully he will learn in time. And hopefully soon I’ll have a dream about my own characters that I can remember, because other people keep beating me to it! He’s got 99 problems, but a flish ain’t one. Blank used Leer! Floyd’s defense fell. Slice used Leer! Blanks defense fell. Blank is immobilized by love! Skarva takes over the realm! Blank used the orb of the gods! Skarva used will o’ the wisp! Skarva gained 10,000 ides for winning. SKAERVAH PREVENTS FLED WITH HYPERCUTTER! Rabid fish say “GRR!” all the time? I don’t know why the girl flish aren’t all over him, he is the cutest thing in Idenau. Why did you spell “Davis” “S-l-i-c-e”? That’s really confusing. He wants girl EVERYTHINGS. D:< Flish are no match for "the cutest thing in Idenau"! aw this was cute! i guess not the whole dropping Floyd and leaving him there part but the saving of one’s crush totally makes up for it. Go Slice! thats right, Blank, walk away. Floyd will understand. It’s probably best he just pass out for now anyway. This comic makes me want to never play a videogame ever again. Ever. It also makes me want to punch Blank’s teeth out. Ah well, he has most of them missing already, anyways. And WOAH! Slice is foaming at the mouth! Calm down, dude! I was about to comment, then my captcha said ‘omselepu many’. Darn captcha! I want to know what you had to say! Slice is a good friend. Floyd would be proud, he really would. He wants his little buddy to be happy. Tara and jessie have gravatars of my 2 all time favorite games. I still haven’t played Cave Story because I’M A LOSER but I am ever the Pokémon fan. Hence all the references that get made in these comments. Why does it seem that everybody has or is gonna get a lady *wink,wink* but floyd? I don’t think Lorelei is gonna get a lady. Floyd doesn’t have any special someone in mind, but he doesn’t have to try very hard with the ladies. I think he’s quite content being the free-floating bachelor for now. Hey, it worked! mAlso, Gilly knows Slice exists now, and he saved her life. Wow, even though I know Floyd is gonna bounce back eventually and be fine, the pain in this strip keeps the tension up nicely. All this action has really givien a fun, suspenseful edge to this comic. EEEK Blank is officially scarier than Skaerva ever thought he was. Sorry, Skaervie ‘ol pal. And now, I shall go back to playing Legend of Zelda: Ocarina of Time on my 3DS and feel like a bully as I beat my way through the Forest Temple. I’ll never see these games the same way again, lol. I must agree with you, Kelly Nelly chan.